ST. THOMAS, U.S. Virgin Islands – Behind a stellar night behind the 3-point line, No. 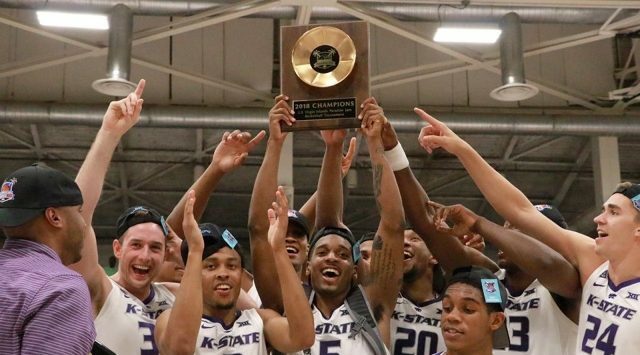 12/12 Kansas State captured the 2018 U.S. Virgin Island Paradise Jam Championship with an 82-67 win over former conference foe Missouri on Monday night in front of 2,274 fans at the UVI Sports & Fitness Center. K-State (5-0) earned the 14th regular-season tournament championship in school history and the first since winning the 2011 Diamond Head Classic in Honolulu, Hawai’i. It was also the sixth career tournament title for head coach Bruce Weber and his first with the Wildcats. Senior Dean Wade was named the tournament’s most valuable player after averaging 17.3 points on 61.8 percent (21-of-34) shooting with 6.0 rebounds and 3.7 assists in three games, while fellow senior Barry Brown, Jr., was one of five players selected as Paradise Jam Tournament All-Stars.